Nothing can strike terror into the heart of a car owner like steam billowing out of their exhaust pipe. It just looks like an expensive problem. Even if you don’t have steam coming out of the car’s exhaust, engine coolant in the crankcase oil looks almost as bad. Likewise exhaust gas in the cooling system and radiator is never good either. These are all symptoms of a blown head gasket. You could add to any one of those symptoms a temperature gauge that goes into the red zone as the engine overheats. That can quickly ruin your entire engine. But before we panic, let’s break down the problem into manageable steps to better understand what a head gasket is, what happens when it doesn’t work like it’s supposed to, and how to diagnose a blown head gasket. Great question. Your engine is constructed of a block assembly, which houses the crankshaft and the pistons inside their cylinders, and one or more-cylinder heads. It’s called a head because it covers the tops of the cylinders. There is a lot of pressure in the cylinders as fuel burns, and something must keep that storm sealed inside. Likewise, hot coolant circulates from passages within the block to passages in the cylinder heads. Those transition points must also be sealed to keep that hot, pressurized coolant where it needs to be. The head gasket does all those sealing jobs. It is like the bologna in a sandwich, except it is sandwiched between the block and cylinder heads and compressed with great force by the cylinder head bolts. The gasket can blow out between a cylinder and an adjacent cylinder. In that case no coolant escapes, but the engine will have a misfire on both of those adjacent cylinders. 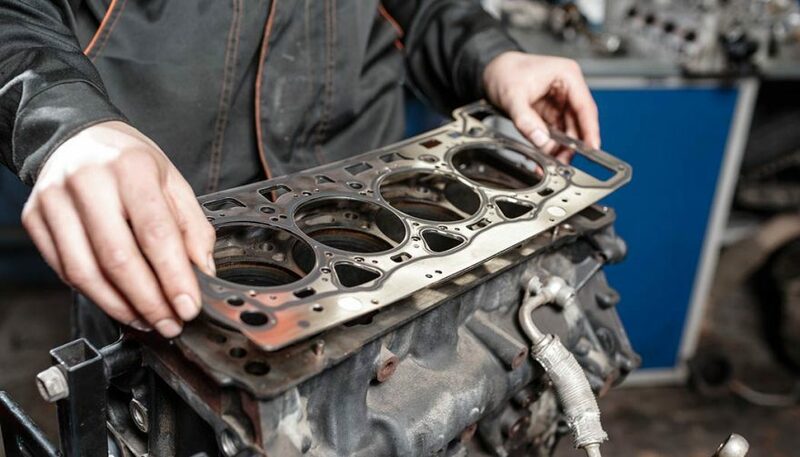 The head gasket can fail between a water passage and an oil passage, or more likely between a water passage and an open area that drains oil back to the crankcase. Either way, the coolant mixed in the hot oil will take on a foamy, milkshake like appearance. Not good, as that watery foam can wipe out delicate, soft-surfaced crankshaft bearings. The head gasket can fail between a combustion chamber and a coolant passage. That releases combustion pressure into the cooling system and radiator. Or, it can allow coolant to enter a combustion chamber, which will flood the exhaust with steam. When a cast iron cylinder head is subject to extreme overheating, from any cause, its exhaust ports are subject to cracking next to its coolant passages. That opening will flood the exhaust with steam. The only cure is to replace the failed cylinder head. Replacing the head gasket alone won’t fix the problem. If two adjacent cylinders have a misfire, then simply run a compression test on those two cylinders. If both readings are drastically below normal then suspect a blown head gasket between them. To confirm your diagnosis, place one cylinder at top dead center, with both valves closed, then inject compressed air into it through the spark plug opening. You can buy a special hose for that. You are looking to feel air escaping from the adjacent cylinder through its spark plug opening. Some air will also escape whichever valves are open on that cylinder. Keep your hands clear of the drive belts, because if the compressed air spins the engine over it can trap fingers. If the engine oil looks like a foamy chocolate milkshake, coolant has been leaking into it. It will be difficult to isolate the exact point of failure, although a blown head gasket is likely the culprit. If your engine has an oil-to-water oil cooler, first insect that. Otherwise you will be removing the cylinder heads and sending them to a machine shop for pressure testing. If you suspect the head gasket failed between a coolant passage and a combustion chamber, try this. Remove all the spark plugs. Make sure the cooling system is full. Use your radiator pressure tester (borrow one from the parts store) to pressurize the cooling system. 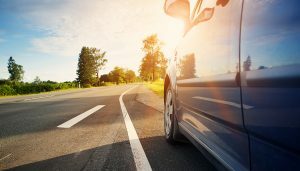 Disable the fuel pump and ignition systems for safety. Then after 15 minutes have a helper turn the key and crank the engine over while you look for coolant to come pumping out of one or more of the spark plug openings. Stand clear, too, as you can get soaked with hot coolant. 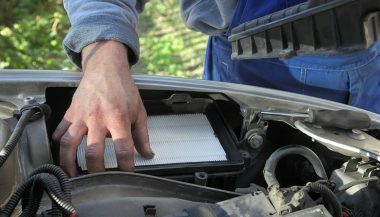 If you suspect that the head gasket failed between a coolant passage and a combustion chamber, then it is because you suspect that exhaust gasses are entering the cooling system and radiator. You can borrow a special tester from the parts store, which contains a special liquid that changes color in the presence of exhaust gasses. Instructions on how to use it will be included. What Causes Head Gaskets to Fail? Overheating is the usual suspect. 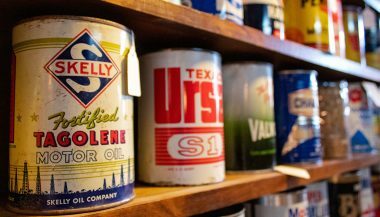 So, after you’ve determined your engine indeed has a blown head gasket, look for causes of overheating. Otherwise you will be repeating the repair again very soon. Cast iron cylinder heads crack, typically in the exhaust ports or between adjacent cylinders. Sometimes the failure is big enough to see. Otherwise the cylinder heads will need to be dissembled, cleaned and then magnafluxed by a machine shop to locate the cracks. While some problems can be repaired, typically on very old engines like antiques, for anything modern you will have to buy a new cylinder head. Aluminum alloy heads don’t usually crack from excess heat. They warp. Again, your machine shop can measure the head for warpage and machine it flat again.